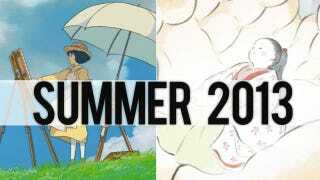 Next summer, Studio Ghibli is releasing two films in Japan: Kaze Tachinu (The Wind Rises) and Kaguya-hime no Monogatari (The Tale of Princess Kaguya). Hayao Miyazaki (My Neighbor Totoro, will direct Kaze Tachinu, while Studio Ghibli co-founder Isao Takahata (Grave of the Fireflies) will helm Kaguya-hime no Monogatari, Eiga reports (via tsk06 and ANN). As previously mentioned, Kaze Tachinu is centered around Jiro Horikoshi, the designer of the World War II fighter plane, the Mitsubishi A6M Zero. Kaguya-hime Monogatari, on the other hand, is an anime retelling of the famous Japanese folktale about a princess who discovers a baby inside a bamboo plant. Both films open next summer at theaters across Japan. Check out their posters in the above gallery.